I don’t like Swiffers. To me, they seem more of a marketing tool than a cleaning tool. 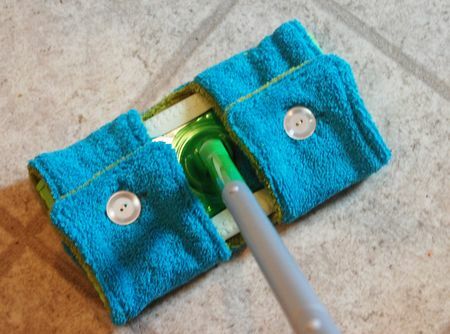 Instead of using a sponge on your mop–which take forever to wear out–they convince you to buy these disposable cloths instead. As a consequence, you have to keep buying more of the cloths to continue to clean your house. Still, I understand why some people like Swiffers. Mops get gross. It is hard to change the sponge, and when you do, they are expensive to replace. It is more convenient to use a Swiffer. It is a reversible, washable Swiffer cover made from old towels. When it is gets dirty, you simply throw it in the machine. No more buying disposable Swiffer cloths, which saves money. And since it’s from recycled towels, it probably costs almost nothing to make.